To register your xChip, you must first get your free device from our xChip Headquarters in Coda. You can find this by simply searching for xChip Headquarters under Places in Second Life. 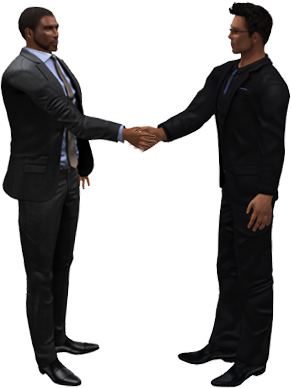 Once you attach your device for the first time, we will generate you a free account through Second Life. Get the attention your business needs. As cheap as US$0.0078 or L$2 per impression. What is the Advertisement Program? 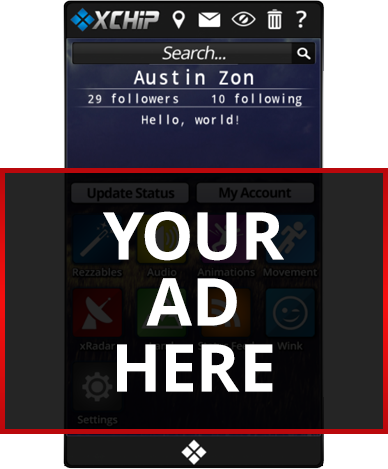 The xChip Advertisement Program opens up doors for grid-wide endorsement for individuals and businesses in Second Life. Submit an advertisement and have it instantly projected on every xChip device in 30 minute intervals, and displayed on ad boards across the grid. Get your product/service/event in the spotlight in just minutes. Direct traffic to your webpage or land parcel with our easy on-click actions. Whenever a user clicks your ad, you have the choice for it to load a webpage or load the Second Life map to your land. It's that easy to broadcast your message to the fastest growing network on the grid. Advertisements cost per impression (per view). That way if your advertisement is not being shown, you don't pay for it. Advertisements are payable in xCredits (L$10 per 1 xCredit) which can be purchased through xChip Terminals located at the xChip Headquarters in Coda. Once you submit an advertisement, it must be approved by xChip Administration to verify no mature/inappropriate content is being distributed. Upon approval, your ad will go live to the grid. Once your advertisement is approved, we provide you with the tools necessary to track your ad's preformance. Easily log in to the Advertisement Manager and check how many impressions your advertisement has generated, aswell as how many clicks your ad has, on a daily basis. You can also generate reports for a selected daterange to compare days, weeks, months, and years. You will always be able to tell how well your advertisement is performing. Start your advertisement campaign today! We would be happy to help you with any of your xChip related questions. We'll try our best to get back to you within 24 hours. © xChip 2019 All Rights Reserved.